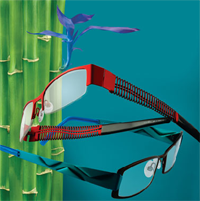 The adoption of technology has enabled Audace Lunettes to stay ahead in the fast paced, eyewear industry. A premium eyewear distribution company, based in Quebec, Audace Lunettes specialises in the import of high end, eclectic collections of frames from Europe for distribution throughout Canada. High end eyewear has seasonal collections as eagerly anticipated as new lines from top designers in the fashion industry. Eyewear has gone beyond the everyday necessity of wearing glasses, turning them into true fashion accessories. Alain Lachambre, president of Audace Lunettes recognized the adoption of technologies as a way to differentiate his company and maximize returns from the short life cycle for new designs. Audace Lunettes has successfully addressed a specific segment of the market "We have established a selective distribution channel based on brand" said Lachambre "we focus on mid to high end product and using technology provide a level of service that WOW's our customers". The frequent introduction of new lines of eyewear makes regular meetings with customers very important. Showing samples of new designs, taking orders and ensuring the eyewear displays are filled with the latest styles are all in a days work for his sales team. Lachamber was quick to realize the potential of the iPad, equipping each of his territory sales reps and making it easy to enter orders directly into a new online B2B portal. This streamlined the sales and order entry process and gave him a jump on other vendors still using paper order entry forms. The B2B portal used by his sales team is also accessible directly by his customers to place orders, saving time, eliminating paperwork and reducing the steps in the process from order to shipment. Within four months 50% of all sales volume was being transacted this way. Having complete visibility of the business is vital and this is what Klipfolio Dashboard provides for Audace Lunettes. "I have a passion for indicators" says Lachambre "In this industry it is normal for retailers to return a percentage of unsold frames to make way for new lines so it is important that I always have an accurate view of my inventory on demand. That way, I can accurately forecast returns and fulfill orders for all of the lines I carry without holding excess inventory." Lachambre's passion for indicators is not limited to measuring the business. Being able to adapt quickly to external factors that may impact markets is also important. "Being aware of external influences I can't control, such as currency fluctuation, enables me to make changes to the business as needed. Klipfolio provides me with an accurate, up-to-date view of my key business metrics and external indicators so I can react accordingly and affect my business outcome". Audace Lunettes has deployed Klipfolio Dashboard to provide real time visibility of key metrics that are critical to ongoing business success and growth. "I use the analogy that being a manager of a company is like being a pilot" says Lachambre "I have complete control of the aircraft, but air traffic control advises me of what speed, altitude and course I should be taking, and advises me of things I cant see such as weather conditions, other aircraft movements etc. So, for me Klipfolio Dashboard is like having an air traffic controller on my desktop"
The deployment and integration of Klipfolio Dashboard was completed in four weeks including user training by Klipfolio. Audace Lunettes coordinated the definition and development of Klips and the integration to back office applications. The Klipfolio Dashboard is populated with the Klips that provide Lachambre and his team with the key performance metrics chosen to measure and improve business. "The benefits to the business were immediate. I travel at least five days a month visiting suppliers and customers so being able to manage the business remotely has increased my productivity. Klipfolio Dashboard gives me a clear view of what's happening in the business and if any action needs taking. The business is more efficient as the information I am getting is accurate and current, not being filtered through layers of management or reports."